When you find undocumented objects in your institution, there are things to consider before accessioning or removing them from the collections. The following four steps offer a starting point to begin thinking about your FIC objects in terms of their unique qualities.8 Once considering these fundamental factors, the reconciliation process can begin. As you will see, FIC objects are best addressed on an individual, case-by-case basis. 8 This section is closely based on a handout that was drafted for a session at the 2001 AAM conference in St. Louis, MO. The session was entitled "Found in Collection: Recurring Nightmare or Golden Opportunity?" Permission to use granted by author. Determine the object's status (as best you can). Information about where it was physically found, may help hasten the reconciliation process. The object was found in collections area and has an accession number and there is no standard Deed of Gift but there is some evidence of DONOR. The object was found in collections area and has an accession number and there is no standard Loan Agreement but there is some evidence of LENDER. The object was found in a collections area and has an accession number but is lacking other in formation. The object was found in a collections area and is missing all documentation. The object was found in a non-collections area and is similar to other objects in the collecti on. The object was found in a non-collections area and is not similar to any other objects in the collection. Is object is relevant to your museum's collecting mission? What is the object's physical condition? What is object's monetary value? What is the object's value, either scientific, scholarly, historic, aesthetic for any institut n? Is object is of Native American origin? Does the object contain materials derived from a threatened or endangered species? Loan it to other museums? Is your museum in a state with museum-specific old loan legislation? Does your old loan legislation make provisions for reconciling undocumented objects? Is your museum in a state without museum-specific old loan legislation? Does your museum have access to legal counsel? When you begin reconciling your FIC objects, there are several places to locate possible information about the objects. Conduct formal or informal oral histories and mine the museum's institutional memory are there staff members, volunteers, or docents who have been at the museum for a long time and might remember seeing the object? If you decide to accession an undocumented object into the collection, consider assigning it a number unique to FIC objects. Using a unique number ensures that the object can be tracked easily and that, should the object's original accession number surface at some point, the FIC number can be retired without creating a gap in the standard accession number sequence. You can also add a flag in your collections management database that identifies the object as FIC. Whatever system you choose, make sure the number is unique, unlike any of your museum's other numbering schemes, and be consistent. A yearly number which, because of your institution's date of founding, would be impossible to have, i.e. 1950.001.001- if your museum was founded sometime after 1950. Flag in donor, source, or status field of your collections management database or elsewhere in the object's record. Use an alphabetical prefix or a temporary or inventory number as described above. 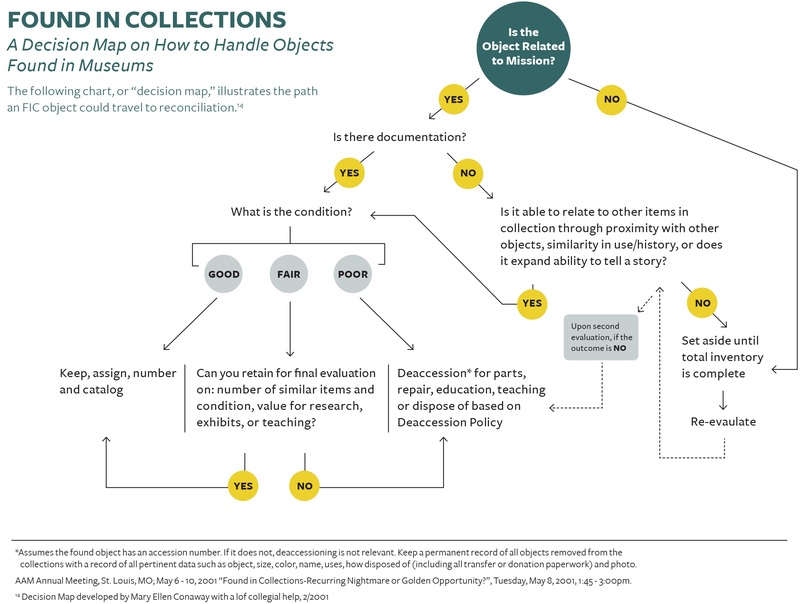 You may or may not decide to add these objects to your collections management database—this is decision dependent on your institution's individual policy. Perhaps the most perplexing issue surrounding the reconciliation of FIC objects is what to do if your museum decides that it no longer wants the objects. Maintaining undocumented objects that do not meet the museum's mission, are inferior duplicates, are irreparably damaged, or pose a threat to the staff or permanent collection in some way, can be unnecessary and expensive. But there are currently no standard national guidelines that aid in the disposition or deaccession of these types of items. When thinking about removing FIC items from the museum, you must first understand the legal implications of the decision. After this, you can then choose the best course of action based on factors such as your state's existing museum-specific law (or lack thereof), the public relations aspects of your decision, and the amount of time and/or money your and your museum can devote to FIC reconciliation. When deciding to remove FIC objects from the museum, either by disposition or deaccession, consider the following questions and applications. Note that these are questions and suggestions that are meant as starting points. They are in no way intended to replace the help or advice of legal counsel. 9 Malaro, 355. Note: In compiling this guide, this author did not find any published legal proceedings regarding cases brought against museums by wayward owners returning to claim their objects. It is unknown whether the legal standing of either the museum or an FIC object’s rightful owner has yet been tested in a court of law. Does your state have a museum-specific law regulating the disposition/deaccession of undocumented objects? Currently, thirty-four states have museum-specific laws to assist in the acquisition and disposition of old loans and undocumented objects (note: not all laws cover both types of objects). Does your state have a general unclaimed or abandoned property law that provides guidelines for the disposition of abandoned property? Individual states' abandoned or unclaimed property laws, or the Uniform Unclaimed Property Act provide guidelines for the disposition of abandoned property. While not written specifically to address museum objects, these laws could be helpful. The Uniform Unclaimed Property Act states that property that has been abandoned for five years or more could be reported and delivered to the government official designated as the "Administrator” for purposes of the Act. Likewise, these laws also make provisions for the disposition of property whose monetary value falls under a prescribed dollar amount. Will there be public relations aspects to consider? Deaccession or disposition of undocumented objects can foster bad public relations if the community thinks the museum is unjustifiably ridding itself of its heirlooms. Developing a public relations strategy is necessary regardless of the size of your museum or community. Approach disposition or deaccessioning slowly and deliberately. Using the Beginning the Process section of this guide will help you determine what the appropriate disposition or deaccession method will be based on each FIC object. Remember that what is the most appropriate procedure for one object may not be the best for another. For example, objects of Native American origin, or objects containing natural materials may require unique disposition methods. Likewise, objects that could potentially endanger staff or the permanent collection may require more expeditious decisions. If you are uncertain as to how to proceed, set aside all your FIC objects, making a "don't know” pile from which you can reconcile objects as you have time and as you determine the best course of action for each item. Note: this suggestion is also applicable for adding items to the collection as well. Thoroughly document FIC disposition and deaccession and be up front and honest about your decisions. File the worksheet systematically as you would other object-related paperwork. If done in good faith, and with the knowledge of all involved parties (this can include the community if applicable), FIC object disposition or deaccession is not something to be ashamed of or to sweep under the rug. Adhering to proper collections management policies demonstrates a dedicated effort to care for the collection in toto. Ascertain whether the museum-specific law, or the general unclaimed or abandoned property law in your state makes provisions to start the running of a statute of limitations during which time an owner must claim the property or lose ownership rights. Supplied later in the Resources section is a sample affidavit you can personalize for your own institution. 13 Ildiko P. DeAngelis, interview by author, October 2002, Orinda, CA, telephone. Does your CMP include guidelines for resolving undocumented objects? A good policy reflects forethought of potential issues and acts as a "failsafe” measure when such issues arise. The process for obtaining legal ownership rights. This will be governed by the state's museum-specific legislation (if applicable), and should include a written record of the step-by-step methods for obtaining ownership. Any exclusions to the previously mentioned process. For example, will the museum waive undertaking the ownership process if the object poses a hazard to the staff or the collection, is irreparably damaged, is less than an particular value? Consider who will determine the accession status—the museum director or administrator, the collections manager or registrar, the curator, or a combination thereof? Likewise, who will be included in the decision to remove an item from the museum—will this be one individual's decision, a group of museum personnel, or will the decision rest with a higher museum committee? Also consider adding, either in the CMP or in a separate official document, the museum's procedural policies for addressing FIC objects. Outline in detail what these processes will be, taking care to include (as applicable): directions for assigning an object number, tracking the object, the physical numbering of the object, it cataloging, photography, and storage, updating of the collections management database, directions for the resolution of FIC objects should documentation on their true identity surface, and any approved disposition methods. Alternatively, if your institution does not accept unsolicited donations under any circumstances, provide a copy of this policy. Also, include contact phone numbers, e-mails, or business cards to refer the patron to the appropriate staff member if they wish to make an appointment to have his or her object reviewed for donation or loan. Periodically conduct staff training that clearly explains the necessity of obtaining thorough documentation when an object enters the museum and describes how to obtain that information. Training can be formal, or informal, conducted at a dedicated session, or discussed at an all staff meeting. If warranted, special informational sessions can be conducted for visitor services personnel (both staff, volunteers, and docents) and security staff—usually the "front line” workers who initially meet anyone dropping off an object at the museum. The following are definitions for terms used throughout this guide. (1) an object that has been removed permanently from the museum collection; (2) formal removal of accessioned objects from the museum's permanent collection.3 See also Disposition. The act of removing unaccessioned objects from the museum collection. See also Deaccession. State legal statute that provides guidelines for the reconciliation of old loans and/or undocumented objects in museums. Objects that are owned by the museum, that it has the responsibility to house and care for, and that may be used as the museum sees fit—most often for exhibition, loan, or study. Objects in the possession of the museum that have not been formally added to the museum's permanent collection but still require storage and care. The law in each state generally reserved for the resolution of tangible and intangible financial assets. In states without museum-specific legislation addressing undocumented objects, this law may or may not be helpful in reconciling undocumented museum objects as well. Also sometimes referred to as abandoned property law. object in a museum's physical possession or control that is unsupported by any documentation and/or lacks sufficient evidence to prove museum ownership. 14 Rebecca A. Buck and Jean Allman Gilmore, The New Museum Registration Methods (Washington, D.C.: American Association of Museums, 1998), 359. 18 ThesaurusDictionary.com, "quitclaim," http://www.thesaurus-dictionary.com/files/q/u/i/quitclaim.html (8 August 2003). 19 The American Heritage Dictionary, Second College Edition (Boston: Houghton Mifflin Company, 1985), 1273. 20 Marie C. Malaro, A Legal Primer on Managing Museum Collections (Washington, D.C.: Smithsonian Institution Press), 304. Based on the reconciliation considerations posed in the previous section, the following resources have been compiled for ready reference. Provided below is the information necessary to locate the old loan law in your state. In some instances, the legislation also covers undocumented objects. Cal. Civ. Code Sections 1899 et seq. Colo. Rev. Stat. Sections 38-14-101 et seq. Fla. Stat. Ann. [Title XVIII] Chapter 265.565 et seq. Ky. Rev. Stat. Ann. 171.830 et seq. Miss. Code Ann. Section 39-19-1 et seq. Mont. Code Ann. Section 22-3-501 et seq. N.H. Rev. Stat. Ann. [Title XVI] Section 201-E:1 et seq. N.M. Stat. Ann. Section 18-10-1 et seq. Ohio Rev. Code Section 33.3385.01 et seq. Or. Rev. Stat. Section 358.415 et seq. S.C. Code Ann. Section 27-45-10 et seq. Tex. Prop. Code Ann. Section 80.001 et seq. VT Title 27, Chapters 12-14, §§ 1151 et. seq. Wyo. Stat. Ann. Section 34-23-101 et seq. If your state does not have a museum-specific law regarding undocumented objects, and you or your institution thinks it prudent to get advice before accessioning, disposing of, or deaccessioning your FIC objects, you may wish to contact your state’s unclaimed property office or the office of your state’s Attorney General for guidance. Some museum objects contain materials derived from endangered or threatened species. For information on federal laws protecting wildlife, and the possession, sale, and movement of objects containing their materials, contact the U.S. Fish and Wildlife Service [http://www.fws.gov/], (800) or (703) 358-2104. Supplied below are several of the acts protecting wildlife. For a complete list, see: http://laws.fws.gov/lawsdigest/indx.html. For help regarding objects containing materials derived from endangered or threatened species, direct questions online to PERMIT-L. This is a moderated listserv, hosted by the Smithsonian Institution. Does the old loan legislation (remember, in some states these laws cover undocumented objects), or unclaimed or abandoned property law in your state provide a means for triggering the running of a period in which an owner must claim the property or lose ownership? If so, you may consider starting the statute of limitations running on your undocumented object(s) by making a record of the object(s) as of the current date. The following page contains a sample affidavit form that can be modified to fit your institution’s needs. 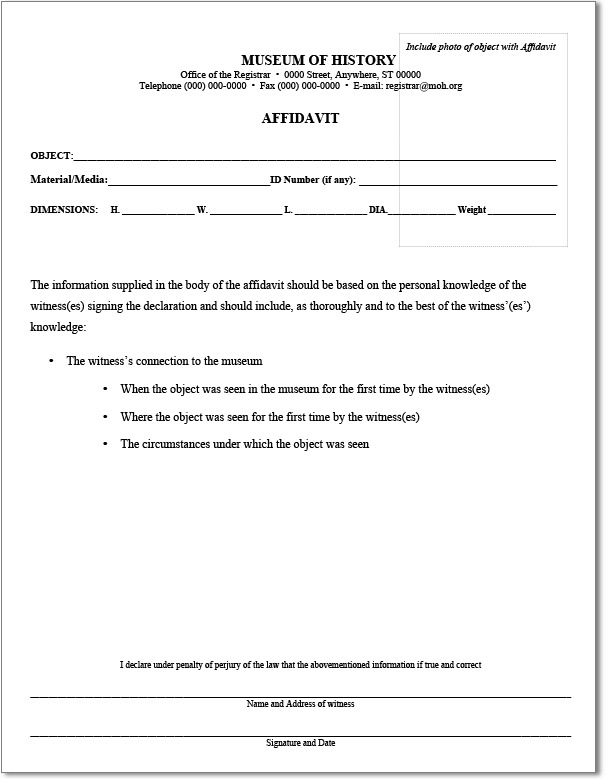 The following is a sample image of a Museum of History Affidavit form. Download a PDF of this form. The following chart, or "decision map," illustrates the path an FIC object could travel to reconciliation.